Join us for the latest episode of Type1Radio Lounge, during which Miles will be taking the reins while Steve, Phi and Swami form the rest of the panel. 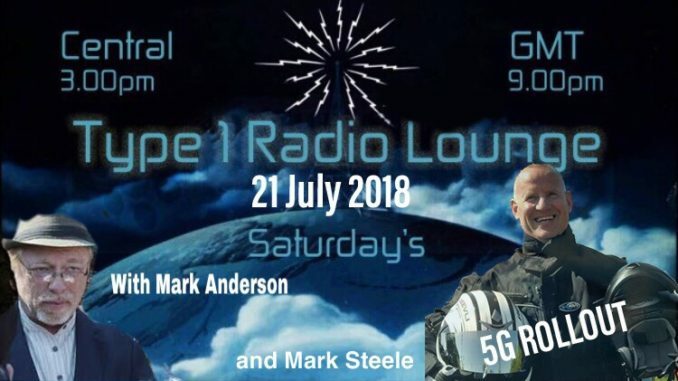 This week we have tech expert Mark Steele joining us to discuss the dangers of 5G, which has already started being deployed within the U.K.
Later in the show we’ll be joined by friend of the show Mark Anderson the Truth Hound. In addition to the announcements Mark has to make, his appearances on the show always add colour and the Truth Hound’s particular brand of flair. Join us for what promises to be a great discussion, with music in the breaks. Save Us Now – S.U.N.